I’m a big fan of multi-taskers. There’s nothing worse than having items in your house, your desk, your messenger bag or your purse that do one thing, and one thing only. Once you get over 3-4 items, then you start losing room for the essentials of your MP3 player or your cell phone. Being a gadget geek, I appreciate it when something simple is combined with some useful and practical technology. X-treme Geek has one of those great multi-tasking products. The Popdrive Bottle Opener is a 1GB thumb drive that has an attached bottle opener. So now you can have one item in your arsenal that will transfer your files and open those cold beverages without using your teeth or that belt buckle trick that never works. It also has an attached carabiner-style key chain that easily clips to your belt buckle, backpack, purse or your set of keys. The Popdrive Bottle Opener also can separate the flash drive from the bottle opener so you can transfer files and open that frosty beverage with the pesky bottle caps all at the same time. They really should’ve called it the Beerdrive Bottle Opener, but perhaps that’s just because not many brands of pop still come in bottles that need a bottle opener anymore. The attached 1GB thumb drive is both USB 2.0 and 1.1 compatible. 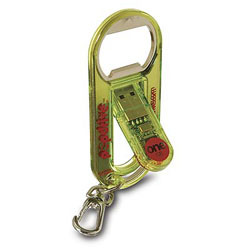 The entire Popdrive Bottle Opener measures 3.75″ long by 1.5″ wide by 0.5″ high. X-treme Geek has these in stock for $24.95 each. Alternatively, you can always check out the Bevy. If only they’d add a little flashlight to this. Then I’d totally buy it to combine all my little keychain gadgets!